My "Exploring Landscape" photo workshop starts Oct. 20th! Attending the Stanford University powwow in May is an annual rite for me. Like most traditions, it helps me find my center. It’s a good way to begin a new season of Native American celebrations, and it’s close to home. Yet within the comfort of tradition, it also feels important to find something new. That’s what I was seeking when I created this image. 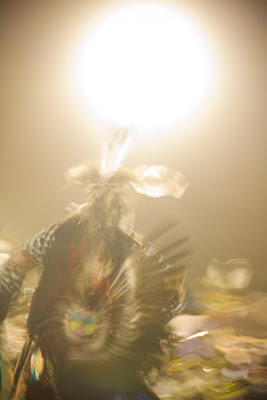 I’d been experimenting with new ways to see traditional dancers when I noticed the overwhelming flood light in my camera frame. Instead of going with my first instinct – to eliminate the large, distracting white light from my composition – I decided to make it part of my subject. Though this is a night shot, the huge light becomes the sun. Many Plains tribes practice traditional Sun Dances, which once were banned and then later restored by federal law. In these communities, this ceremony marks the beginning of a new year. It’s a time for them to renew their traditional spirituality, asking for a good year for their families and tribe. This photograph shows the timeless dance at the start of summer, when night and all it represents transforms into day. The sun is at its zenith and a dancer celebrates life. On April 28th, I was watching a busy Saturday evening crowd gather in front of Oaxaca City’s colonial cathedral. The capital of Mexico’s state of Oaxaca, this high altitude southern city is a place filled with a flavor all its own: one strongly indigenous. There are 16 Native languages spoken here, while few speak English. In Oaxaca, I am a tiny minority. Carrying only a Canon Elph SD1000 isn’t my typical MO, but I was recovering from flu just in time to take this vacation, so I had to travel super-light. This meant my little camera was always with me, and I was connecting first with people, places and what was going on around me, grabbing shots on the fly. I’d forgotten my camera’s manual, so I chose to capture images on the Elph’s Auto setting, selecting only format size (Large Jpeg) and whether to use Flash or not. Going light and simple means: being able to have direct experience without “serious” hardware demands. I normally shoot with a Canon 7D, and sometimes a Speedlite 580 flash. As familiar as I am with this equipment, “lug, set, adjust and shoot” takes more energy than I had this time around. Keeping one’s eyes wide open for the unexpected and shooting simple makes photographing even more spontaneous. Street photography can be even fresher. 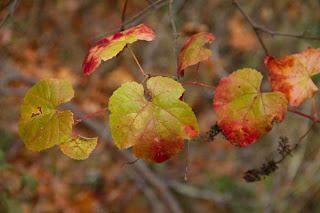 I skipped bracketing, and thanks to LightRoom 3, my post-production recovered exposure-challenged images. 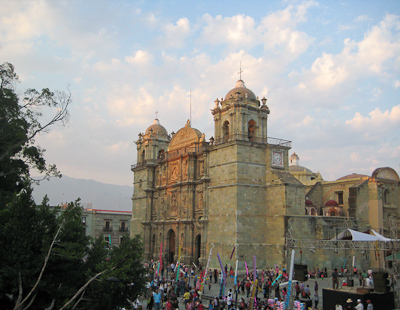 In this photo of Baroque Oaxaca Cathedral and its plaza, Saturday night throngs in contemporary, even fashionista, clothing celebrate among balloons and around a stage that later hosted a protest for education reform. Undoubtedly, some of these people come from remote, poor Zapotec, Mixtec and other Native villages that dot the rough mountains covering most of the state. The villages’ inaccessibility is part of why this area has such a vibrant Native culture.